A Stimuli Article to the Revision Process regarding the proposed New USP General Chapter “The Analytical Procedure Lifecycle <1220>” has been published. Read more about the new concept for the lifecycle managment of analytical methods. The General Chapters—Chemical Analysis Expert Committee is currently developing a new general chapter <1220> The Analytical Procedure Lifecycle. The purpose of this new chapter will be to more fully address the entire procedure lifecycle and define concepts that may be useful. A Stimuli article on the proposed General Chapter <1220> has been approved for publication in Pharmacopeial Forum 43(1) [Jan.-Feb. 2017]. USP is providing this Stimuli article in advance of its publication to provide additional time for comments. Would a general chapter on the lifecycle approach be valuable? Is the information presented herein sufficient for implementation of an analytical procedure under the quality by design (QbD) approach? Would incorporation of references to statistical tools, either in this chapter or in another chapter, be valuable? Can you provide input or approaches that would improve this proposed general chapter? The content and scope of the proposed general chapter will be refined on the basis of responses to this Stimuli article. Because stakeholders may have differing views, the objective of this Stimuli article is to identify and build areas of consensus that may be included in <1220>. The approach is consistent with the concept of quality by design (QbD) as described in International Council for Harmonisation (ICH) Q8-R2, Q9, Q10, and Q11. A fundamental component of the lifecycle approach to analytical procedures is having a predefined objective that stipulates the performance requirements for the analytical procedure. These requirements are described in the analytical target profile (ATP) which can be considered as analogous to the quality target product profile (QTPP). The Download Stimuli Article is available on the USP website since October 14, 2016: Proposed New USP General Chapter: The Analytical Procedure Lifecycle <1220>. Comments will be accepted until March 31, 2017, the end of the comment period for Pharmacopeial Forum 43(1). 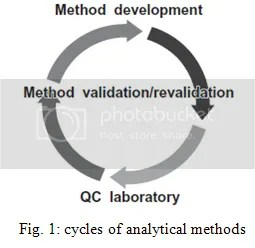 This Stimuli article provides the framework for the proposed general chapter “The Analytical Procedure Lifecycle <1220>” and describes the current thinking of the USP Validation and Verification Expert Panel which advises the General Chapters—Chemical Analysis Expert Committee with regard to future trends in analytical procedures development, qualification, and continued monitoring. On June 24, 2016, the USP announced the elaboration of a new general chapter <1220> regarding life cycle management of analytical methods. Read more about the new general chapter <1220> “The Analytical Procedure Lifecycle“. On June 24, 2016, the USP announced the elaboration of a new general chapter <1220> “The Analytical Procedure Lifecycle”. Input Deadline is July 29, 2016. The suggested audience are drug product manufacturers, dietary supplement manufacturers, testing organizations, and drug product related regulatory agencies. The approach is consistent with the concepts of Quality by Design (QbD) as described in ICH Guidelines Q8 (R2), 9, 10, and 11 and with the expected new ICH Guideline Q12 (Lifecycle Management). focal point: Analytical target profile (ATP), comparable to the Quality Target Product Profile (QTPP). Fitness for Use: Decision Rules and Target Measurement Uncertainty. PF 42(2) [Mar.–Apr. 2016]. Additionally, the USP proposed a revision of general chapter <1225> “Validation of compendial procedures” in PF 42(2) [March-April 2016]. This chapter is being revised to incorporate a section on “Lifecycle Management of Analytical Procedures”. The revision is an attempt to better align the validation concept with the recently (July 2015) issued FDA guidance “Analytical Procedures and Methods Validation for Drugs and Biologics”, which also includes a section on “Life Cycle Management of Analytical Procedures”. Estimated proposal for the new general chapter <1220> “The Analytical Procedure Lifecycle” is PF 43(1) [Jan.–Feb. 2017]. Furthermore, an USP and ECA Joint Conference and Workshop on Lifecycle Approach of Analytical Procedures will be held November 8-9, 2016 in Prague, Czech Republic. For more information please visit the USP website – Notices- General Chapter Prospectus – The Analytical Procedure Lifecycle. In the Pharmacopoeial Forum (PF) 42(3) (May-June 2016) the USP General Chapters – Packaging and Distribution Expert Committee proposes a new general chapter <661.3> Plastic Components and Systems Used in Pharmaceutical Manufacturing and a revised version of general chapter <1661> Evaluation of Plastic Packaging and Manufacturing Systems and Their Materials of construction with Respect to Their User Safety Impact. Read more about USPs Proposal on Plastic Components and Systems Used in Pharmaceutical Manufacturing. <1661> Evaluation of Plastic Packaging and Manufacturing Systems and Their Materials of construction with Respect to Their User Safety Impact. Read more about USPs Proposal on Plastic Components and Systems Used in Pharmaceutical Manufacturing. In the Pharmacopoeial Forum (PF) 42(3) (May-June 2016) the USP General Chapters – Packaging and Distribution Expert Committee proposes a new chapter to address the qualification of plastic components used in the manufacture of APIs (pharmaceutical and biopharmaceutical) and drug products (DPs). The proposed Title of the new chapter <661.3> is Plastic Components and Systems Used in Pharmaceutical Manufacturing. The draft is open for comment until July 31, 2016. The chapter is part of a suite of chapters, including Plastic Packaging Systems and Their Materials of Construction <661>,Plastic Materials of Construction <661.1>, Plastic Packaging Systems for Pharmaceutical Use <661.2>, and Evaluation of Plastic Packaging and Manufacturing Systems and Their Materials of construction with Respect to Their User Safety Impact<1661>. In addition a section has been added to general chapter <1661> to support the use and understanding of the new general chapter <661.3>. The revision of general chapter <1661> (including change of title) also appears in the PF issue 42(3). The chapter <661.3> addresses the qualification of plastic components used in pharmaceutical manufacturing and is applicable solely to those processes that involve liquid process streams and process intermediates due to the expected increased degree of interaction with liquids. Plastic manufacturing systems for pharmaceutical use include – for example – bags, cassettes, chromatographic columns, connectors, filling needles, filters, sensors, tanks, tubing, and valves.Elastomeric parts such as diaphragms, gaskets, and O-rings are not in the scope of this chapter. A flow diagram that shows a typical bioprocess DP production suite is shown in general chapter <1661>, Figure 2. The manufacturer of APIs and DPs is responsible for ensuring that the plastic components and systems used are suited for the intended purpose. It is likely that raw materials, intermediates, process streams, APIs, and DPs will get in contact with one or more plastic component(s) of the manufacturing suite during the manufacturing process, resulting in process-related impurities (PrIs). PrIs have the potential to alter a quality attribute of the DP, if the PrIs persist through the manufacturing process. They have been established as safe by means of the appropriate chemical testing, such as extractables or leachables profiling and toxicological assessment of the test data (“chemical safety assessment”). The demonstration of equivalence would allow acceptance of the component (or system) without any further characterization. If equivalence cannot be established between the component (or system) under consideration and the comparator, then a Risk Assessment should be conducted. The risk assessment matrix is provided in detail in general chapter <1661>. The outcome of this assessment results in three risk levels: low (A), moderate (B), and high (C). These levels are linked according to the risk of the individual dosage form (e.g. solid oral and liquid oral, others than solid oral and liquid oral) to test requirements as shown in the draft chapter <661.3>. All three risk levels require identification of the component or system as specified in general chapter <661.1>. Identity is only required for those components or systems that consist of single materials of construction (individual polymers only). Biological reactivity testing according to USP general chapter <87> (In Vitro) is required for all levels plus testing according to Class VI in <88> (In Vivo) for Level B and C. Level A and B require that the component or system be tested as specified in general chapter <661.1> for physicochemical characteristics and extractable metals characteristics. Level C components (or systems) must be characterized more rigorously than level A and B components in view of the extractables profile. Additives: For level A components reference to 21 CFR Indirect Food Additive regulations is sufficient, for level B components additives are determined by testing, and for level C components extraction studies have to be performed. After free registration in the Pharmarcopoeial Forum you can read the complete drafts of the new general chapter <661.3> and the revised chapter <1661>. USP defers implementation date to work closely with ICH Q3D. USP will also form a new advisory group for implementation of the new general chapters on elemental impurities.